a highly efficient means of converting different ores into pellets ores. These include ferrule chrome, niobium, iron, manganese and nickel, as well as steel plant dust. The material is conveyed through the furnace on a perforated steel belt. The manufacture of these belts requires considerable expertise due to the size of the belt (up to 6 m wide and 100 m long) and the perforation pattern. As a world leader in steel belt technology, we not only offer this level of expertise but can also specify and deliver the optimum steel belt grade to ensure maximum return on your investment. Steel belts are an essential component in rotary casting systems for the continuous production of aluminum strip (the same process can also be used for copper). 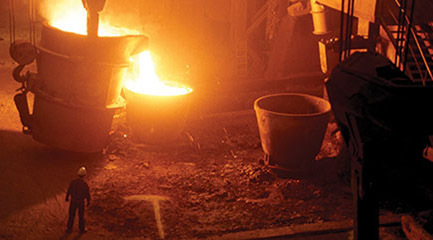 The metal is cast by means of a rotating steel belt and a grooved, water-cooled casting wheel. Liquid aluminium is poured into the groove on the casting wheel and held in place by the steel belt. It enters the system at 700 °C and leaves at around 350 °C. The IPCO steel belt delivers superior performance compared with lesser quality materials, ensuring a longer working life and increased productivity. Another high temperature application for IPCO steel belts is the reduction- based separation of metals from waste, such as scrap refining, extraction of metals directly after ore mining, melt furnace processes and the removal of nickel from slurry. Typically, this will see the slurry transported on the steel belt through a gas-fired furnace – where temperatures will reach as high as 700 °C – then a cooling zone and finally to an outlet station. As well as producing the steel belt, we can also provide the drive and conveyor components including tension station, cast iron skid bars for belt support, support rollers and tracking devices.